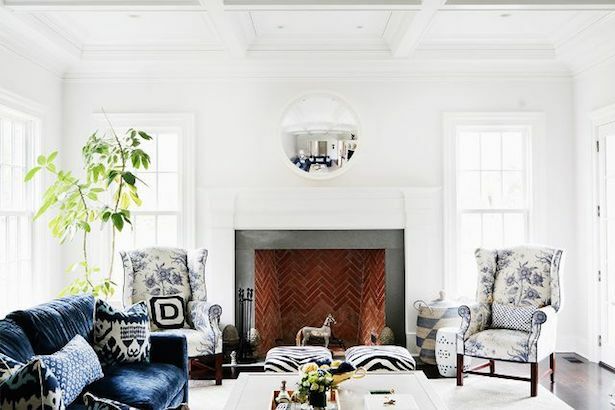 Natural textures, chinoiserie accents, and a blue and white palette create a cozy yet chic family room! I am dreaming of new furniture in our family room. Our current sofa is about 9 years old, and while I loved the sofa when I purchased it, now it is starting to show some age, and I’m bored with the overall look and color. Plus S. hates sitting on it. Our other furnishings are almost as old, and starting to show some wear and tear too. Our family room is a long narrow space with a sliding door on one end, a fireplace in the middle of the longest wall, and two other doorways to a hall and to the kitchen. Needless to say, the space is a little difficult to work with. A sectional would be the perfect solution to streamline the space and provide ample seating for movie nights and relaxing evenings. 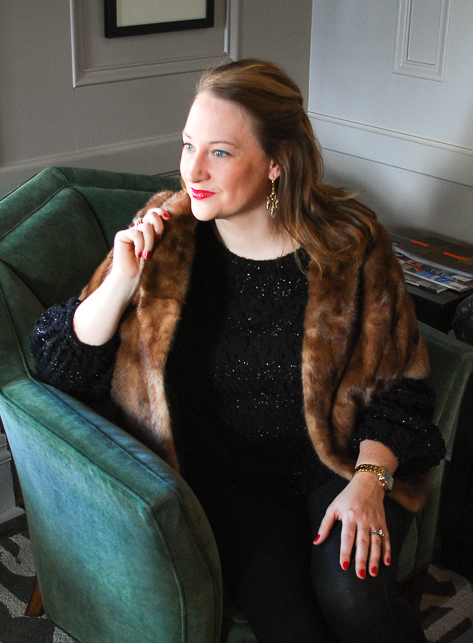 In terms of decorating the family room, I want a space that is both chic and cozy. The family room has to be practical; we use this room everyday; we have dogs; and it has to withstand all of that. 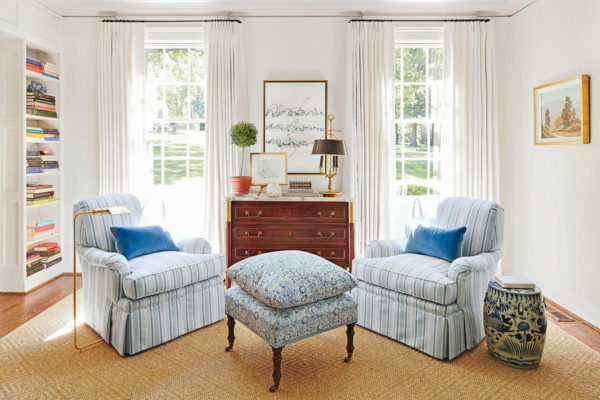 But I am not willing to give up style either, so for the family room decor I’ve tried to balance our practical needs for the room with my traditional, preppy style. 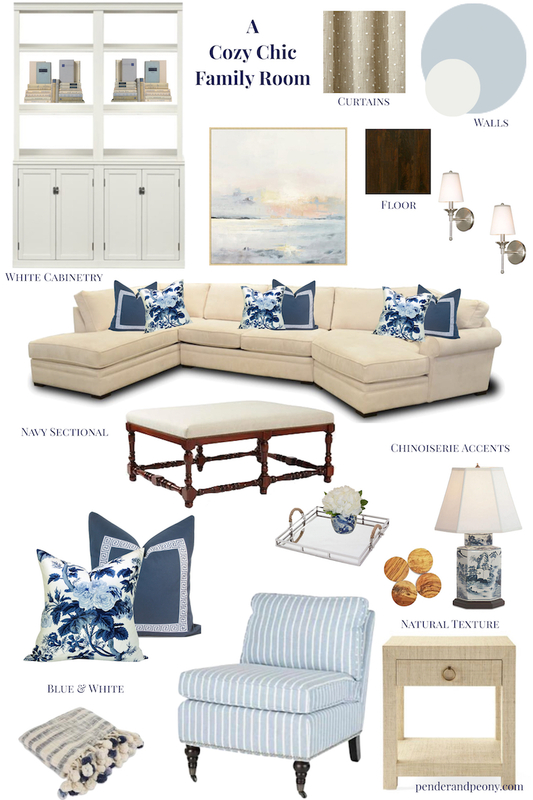 I’ve chosen a classic color palette, blue and white, and paired it with chinoiserie accents and natural textures for a laid back, chic feel. Take a look below! Which color would you choose for the sectional? To keep the family room casual, I want to introduce a lot of natural textures like wood, rattan or raffia, linen, and jute. I love these raffia end tables from Serena & Lily. 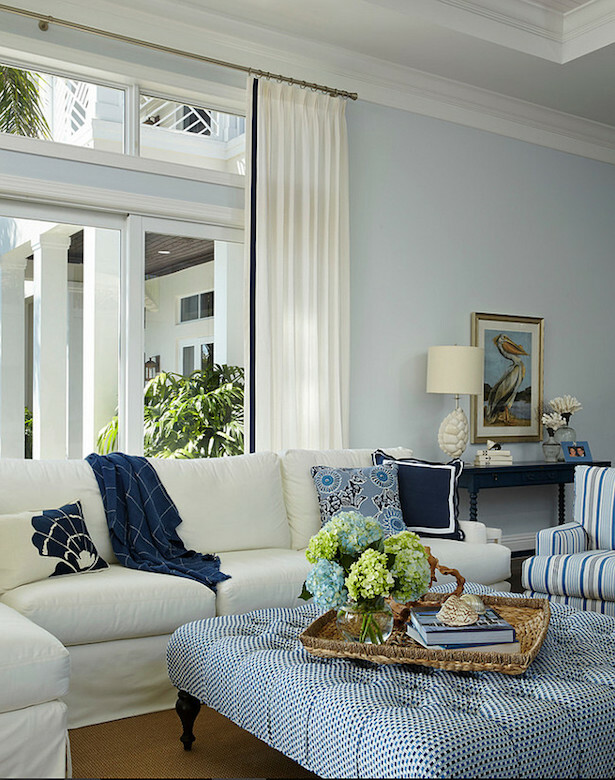 The raffia adds just the right amount of texture and the color and style is contemporary. The curtains are another way I plan on adding natural texture, and these polka dotted ones from Ballard Designs are so sweet. Finally, the area rug in a natural fiber will complete this theme. I’m loving this rug, this one, and this one. Oh the choices! Check out more of my inspiration on my Pinterest board for this room. I would love your advice about the sectional fabric color! Comment below! Thanks so much Nancy! I was looking for an ottoman that had a bit of a masculine feel, and the turned wood on this one kind of reminded me of that English manor look, but you maybe right. Yes! I’m glad this is starting to be the consensus! My vote is for Navy! I like the navy for the room. What color is your dog? If it is light will that be showing up on the sofa or if the dog is dark will that show on on a light sofa? That could play a factor in the choice as well. Good luck. Thanks Iris! Henry (our dog) is white and black, so could go either way. This is really wonderful. I just love this. 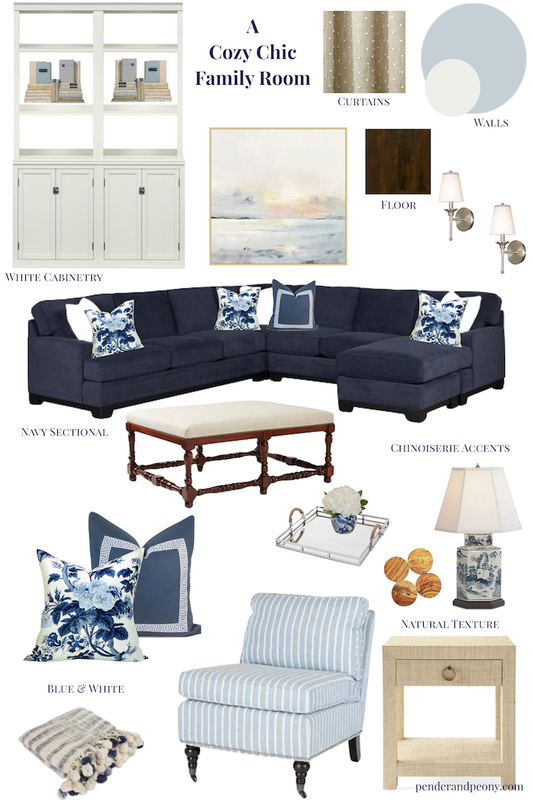 I tend to like light colors, but in this case I like the navy sofa. I can’t wait to see the final room! 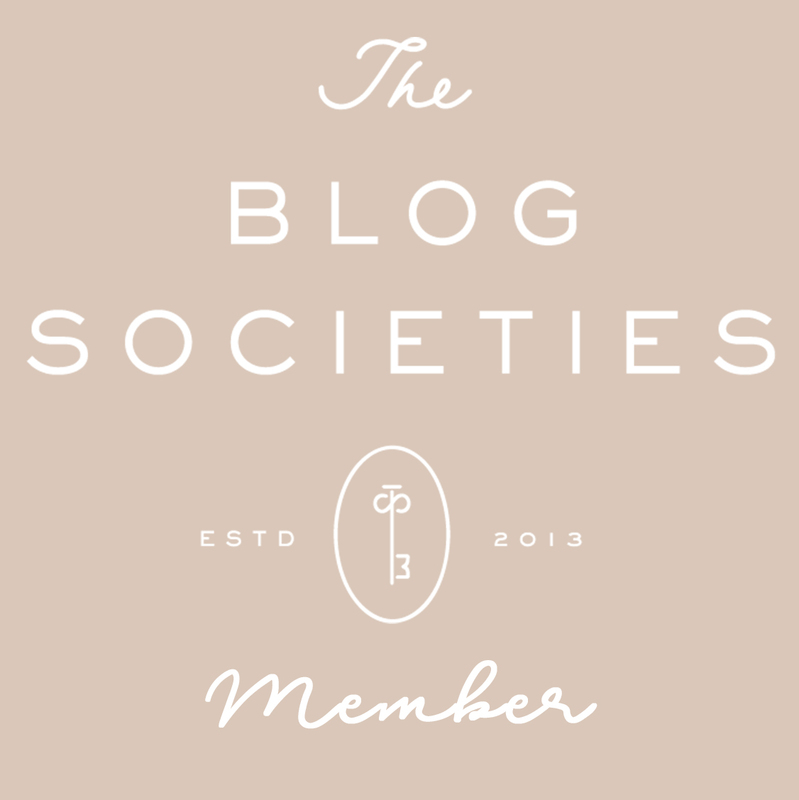 Thanks Mary Sue! We just got the navy sofa in, so I’m working on getting the room completed!